I've lately fallen into a K-pop K-hole, listening to Spotify's K-Pop Daebak playlist. The Korean word daebak can mean different things in different contexts: "surprise!," "big success!," or "awesome!" It's also the name of a new Korean barbecue restaurant on the second floor of the once desolate eastern corner of the Chinatown Square mall. 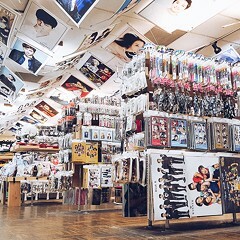 Daebak is owned by a woman named Namhee Kim, who a few years ago, drawn by an untapped market of K-pop-loving Chinese teenagers, opened the K-Pop of Chinatown store on nearby Wentworth. 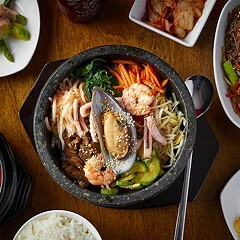 Hoping to further lasso a particularly Chinese appreciation for all things Korean, Kim opened Daebak three months ago. Its most prominent feature is a strategically placed television the size of a small car that broadcasts a stream of music videos starring synchronized groups of impossibly beautiful and talented automatons singing about ice cream cake, love dust, and "boombayah." 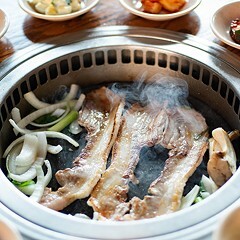 It's difficult to fully focus on mounds of sizzling beef and pork mere inches from your face while the rapper Jimin struts on the screen above your table snarling "You a freaking puss puss," but Daebak's environs make an concerted effort to distract. 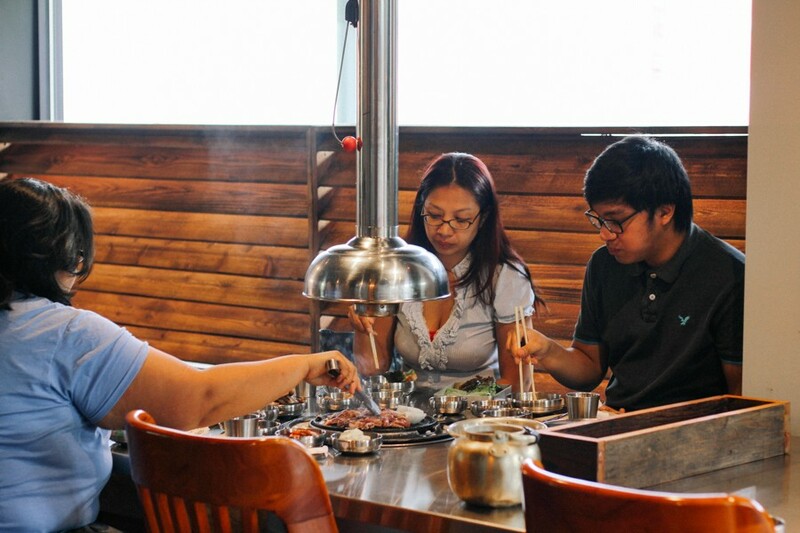 The gleaming aluminum retractable exhaust fans that dangle over the tables block some sight lines, but at least they efficiently vacuum the meaty vapors from the gas-powered grills. Shortly after you order your meats, a domed grill grate with a trio of trenches on the perimeter is installed over the burner, which is then set alight. These are filled with raw onions, yellow corn smothered in white cheese, and a diluted egg mixture poured from a brass teapot. As the grill heats up, the egg eventually solidifies into something that can be scrambled by chopstick, the corn-cheese mixture transforms into a molten mass, and the onions sweat until they're sweet. These built-in sides mitigate the somewhat conservative selection of more traditional banchan (including a pair of nicely punchy cabbage and radish kimchis), which are of varying quality. 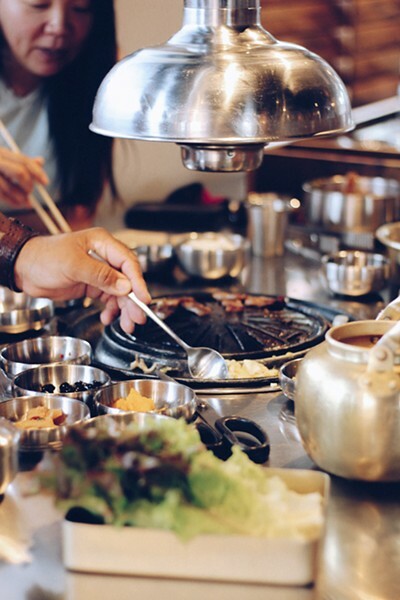 Free side dishes also tend to soften the criticism most frequently lobbed at any given Korean barbecue joint—that the meat is too expensive. 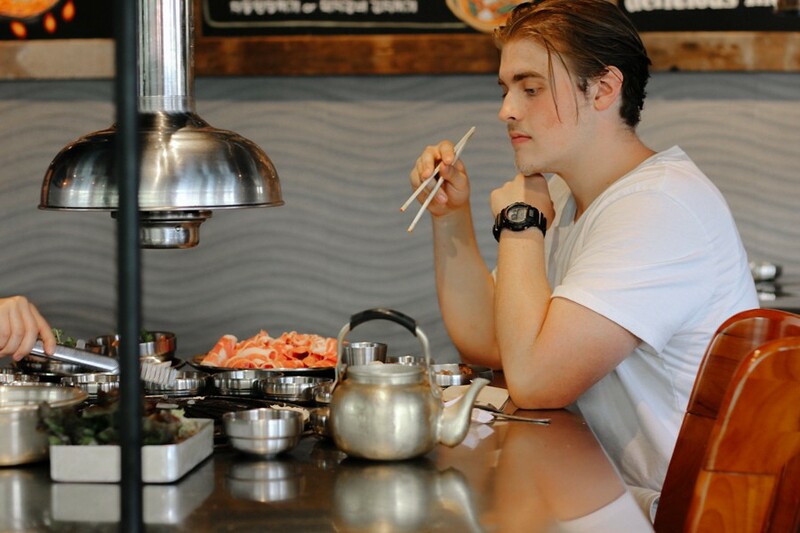 This certainly appears to be the case at Daebak, where a thinly sliced boneless rib eye or ten scraps of boneless short rib top out the menu at $32.99 per order. But these are of decent quality, and the act of griddling morsels of flesh, dredging them in salted sesame oil and the funky soybean-paste ssamjang, topping the bits with spicy scallion salad, and carefully wrapping it all in lettuce or daikon is a methodical endeavor utterly unlike tearing away at a dino-size porterhouse. The process gives the body time to digest, until it realizes it's had quite enough meat. The pork side of the menu is a degree less expensive and features some craveable cuts as well, such as thick slices of jowl laced with delicate formations of fat, and sweetly marinated shreds of collar that caramelize and char in seconds on the grill. The thin frozen curls of pork belly and brisket that feature so prominently on Korean barbecue menus are never a solid bet, and that rule applies at Daebak; the amount of shrinkage and mealiness inherent in such cuts simply isn't worth the price or the effort. The same goes for a grainy potion of skirt steak that sells for nearly $28. 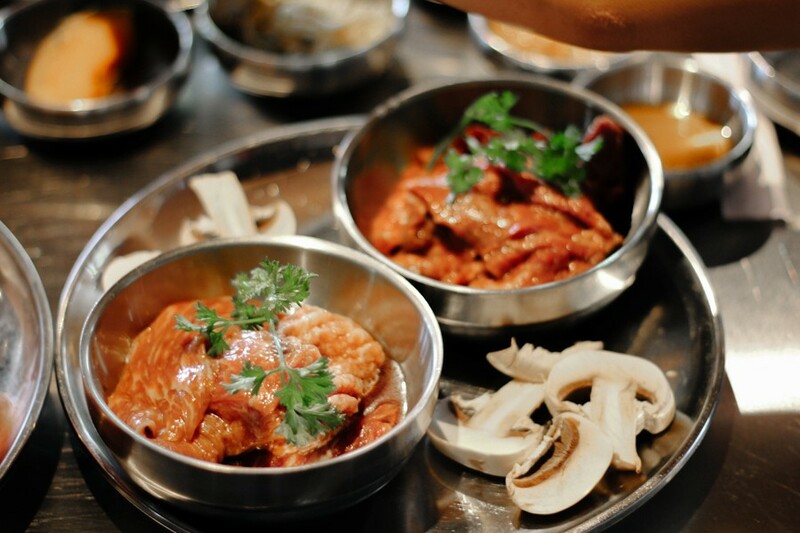 Daebak offers a number of standard dishes to accessorize your barbecue experience. Three large versions of the savory pancake known as pajeon are especially enticing, particularly the variety made with thin, crispy, blood-orange-colored kimchi and a thick, extracrispy seafood house-special version that nonetheless could use more sea creatures. It's unseemly to finish a session in a Korean restaurant without soup, but the common varieties here are a particular disappointment. The stock of a short-rib bowl is so watery one wonders if the meaty bones therein had just entered the liquid at service. The normally spicy shredded beef soup yukgaejang was so similarly bland that I wondered if Daebak was targeting invalids rather than the cool kids of Chinatown. 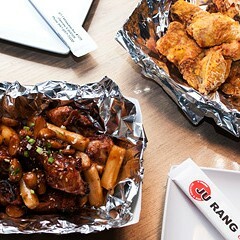 Daebak's inconsistent approach to seasoning is no more apparent than in its presentation of buldak, a plate that seems made to quell the drunken munchies, and one that often attempts to douse the flames of blazingly spiced boneless grilled chicken bits with a thick blanket of melted cheese. You can experience this dish in its finest expression at the great Lincoln Square bar Dancen, but Daebak's insipid, barely spiced version resembles something more like a Denny's skillet. 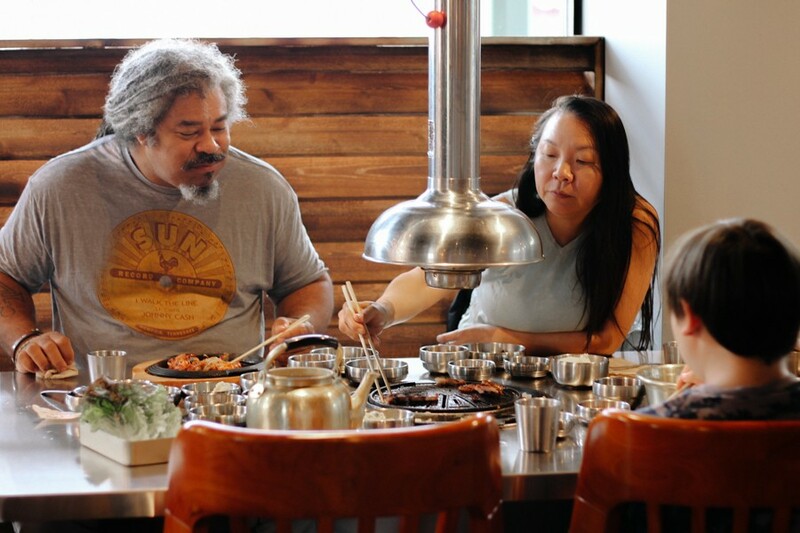 The Boystown storefront excels at scorched rice, savory pancakes, and pork-and-kimchi stew.